In the same way that binding errors are quietly swallowed in production code, exceptions originating in property getters or setters invoked as a result of WPF data binding can also be quietly ignored in production code. Assume that we bind a TextBox.Text property to a string-based property in a ViewModel, as below. Note that when the data binding engine tries to set a property value of “Bob”, we’ll get a NullReferenceException. If we include this code in a release build and do nothing special to listen for binding errors, the exception will be quietly swallowed. The only hint that something went wrong is that the TextBlock that we bind TextLength to doesn’t get updated once we type the second “b” in “Bob”. We can handle these sorts of errors in the same way that we did for other types of binding errors, by adding a binding error trace listener. In Part 1, I described how to use a TraceSource to intercept data binding errors. Below, we convert these binding errors into exceptions. You then can know that the error will get reported at runtime and you can catch and handle the exception as you like. (Code below is inspired by WpfBindingErrors project and Jason Bock’s blog post). Building on the code in the earlier post, we modify the WriteLine method to parse the resulting error message and build up a custom exception type. As before, we attach a listener at startup. We also catch unhandled binding exceptions and display a MessageBox. For a bad property name that leads to a binding error, we then get a nice little error. In WPF, data binding errors by default are quietly swallowed, rather than throwing an exception. Happily, there is a TraceSource that we can use to intercept all binding errors. All data binding errors will go through this trace source and we can therefore add a TraceListener to the trace source’s Listeners collection in order to intercept the error. We start by creating a simple class deriving from TraceListener that overrides Write and WriteLine methods. These methods will be invoked when messages come from the trace source. Note that we don’t yet do anything useful with these messages, but just dump them to standard trace output (to prove to ourselves that we got them). We can now wire our listener into the standard data binding trace source. Below, we do this at application startup. At this point, we’re not doing anything with the binding errors. But if you watch the output window, you’ll see that we’re now capturing them. Next time, we’ll look at converting these errors into exceptions that you can catch. By default, if there’s a problem in how you set up data binding in WPF, the user of the application will never see the binding errors. An exception occurs internally for the binding error, but the WPF application won’t crash or report the exception. Let’s say that we have that we have an application the includes the following properties in an object that we bind to (i.e. the object that we set the DataContext of a window to). (Using SetProp from post #1,205). Now let’s say that we have the following XAML fragment (assume in a Window whose DataContext is set to a class containing the properties shown above). Note the error–we spelled the TextLength property incorrectly, so binding for this TextBlock will fail. If we just build and run the application, we won’t get an exception and the application will run fine. It just won’t bind to TextLength. If you run the application in the Visual Studio debugger and pay attention to the Output window, you’ll see the error reported there. But WPF swallows this error and the application runs fine. 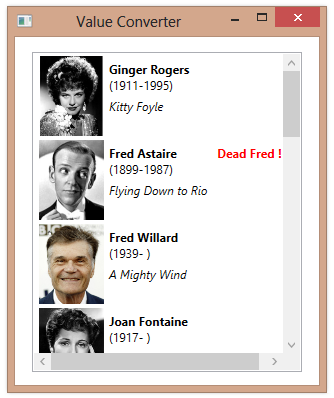 The INotifyPropertyChanged interface is central to using data binding in WPF. You typically create ViewModels containing properties that fire a PropertyChanged event whenever a property value changes. Implementing this plumbing over and over for every property can become tedious. This argues for a reusable pattern to make the per-property code cleaner. Specifying string-based property names when raising the PropertyChanged event can also be error-prone. When, passing property names as string literals, a misspelled property name doesn’t lead to a compiler warning, but just a quiet data binding failure. Below is a pattern you can use to make property change code cleaner. It relies on the CallerMemberName attribute, which can be used to default a method parameter to the name of a caller–the property name in this case. We have a generic method that compares a new property value to the current value in the backing variable. If the value has changed, it assigns the new value and fires the property changed event. A standard property implementation can now look pretty clean. (Note: We’re not checking the return value of SetProp, but we could do that if we wanted to perform other logic when the property value changes). You would generally put this sort of code in a common base class that all of your ViewModel classes could inherit from.